The Best of Teacher Entrepreneurs: ✅ Freebie ✅ ESL & ELD K-5 Curriculum Map - a year long pacing guide! 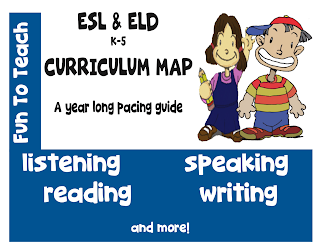 ✅ Freebie ✅ ESL & ELD K-5 Curriculum Map - a year long pacing guide! Every teacher teaches differently, and I tried to create this year curriculum map with many different types of classrooms and teachers in mind. I know you may need to tweak this to the needs of your students, classroom, and administration. That’s OK! For example, March is testing month for me. If you need to switch months around to meet your testing time, that is just fine. Do what is best for your students in your classroom.